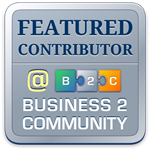 Writing for business, and especially writing for marketing and promotional purposes, is something most of us dread. Yet you just can’t deny the fact that the right words can be very powerful tools in a variety of business activities – from creating effective content, blogs, articles, email campaigns, websites, winning business proposals, and many more. What sets business writing apart from other kinds of writing, is that the business variety usually has to bring about some sort of change in its audience, even if it’s not directly selling anything. The change you want, might just be a change of perception, or a change of behaviour – let’s say, getting potential investors interested in your business, or getting staff motivated and enthused about a new initiative. Even in the case of a blog, you’re offering your readers the chance to change by increasing their knowledge about the topic you’ve written about. And of course, all this applies to pretty well every stakeholder or group of stakeholders in your business, not just customers. That covers everyone from suppliers to retailers to staff to influencers to the media to Uncle Tom Cobley and All. Even if you’re running a very small business, there are quite a few different groups of stakeholders you need to communicate with effectively in your business writing. In my case, for example, I’ve got clients, prospects, social and other media, colleagues, suppliers, publishers, plus a few I’ve probably forgotten. And I’m just a sole trader. Successful business writing is not about writing flashy go-faster words whether online or in print. 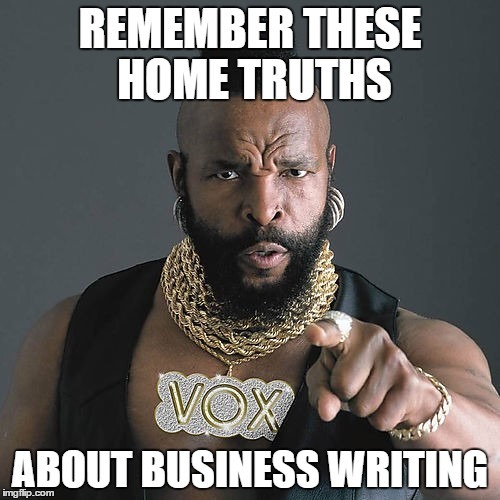 Another basic home truth is that successful business writing isn’t really about writing at all. It’s about thinking. Because if the thinking behind your business message is wrong, it doesn’t matter how wonderful your words are – they just won’t work. Home truth number three, is that learning what I call the “hidden” skills of business writing, in other words how to get your thinking right, well – it’s not astrophysics and it’s not difficult. A lot of it’s just common sense. Before you write anything down, you need to define not what you want to say, but what your message must achieve. Often those two things are very, very different. The sad truth is, “what you want to say” doesn’t work, because it’s usually about your own needs. “What you must achieve” is about what your audience needs to hear – much more powerful. At every stage, ask yourself “does this concept or email subject line or blog post or whatever really help my business message achieve its objectives?” Make sure you can answer an honest “yes” to that question every time. Next, identify your target audience and get to know them very well. No matter how beautifully structured your message is, the home truth is if it doesn’t take into account the real circumstances and needs of the audience, it won’t be on target. Knowing who they are, isn’t enough. Think about their needs; their expectations from you or someone like you. Think about who else is trying to get their attention – not necessarily your competitors, but other people, pressures, obligations. You need to study the media you’ll be using, and the time of day your business message will be received. Be aware of how people will read, see or hear your message. Imagine how they will be feeling when they receive it …. harassed and rushed on a Monday morning in the office? Relaxing over a cup of coffee? Wading through piles of emails on a train or aircraft? Browsing through a newspaper? Surfing the web? Wondering what to buy from your website? Understanding these issues means that you can make your message minimise the disadvantages of each medium, and of course, build on its strengths. And this is particularly important if your business is Search and SEO dependent; knowing not just who your customers are but where they are in the buying cycle, and guiding them to the right place on you website accordingly, is critical to your business’s success. Okay, now there’s one more critical home truth. Rocket science? Nope, just more common sense. It’s called, “what’s in it for me? Face it, folks, human beings are selfish so-and-sos. They don’t care about your mortgage or your overdraft or your kids in private school or any other reason why you want them to do something. They only care about what they’re going to get out of it. So in business writing we always, always, always talk benefits, not features. And for anyone who still doesn’t know the difference, features are what something is: benefits are what those features do for you – in other words, “what’s in it for you.” Even if the benefits are not obvious – when your features are actually objectives, for example in the case of rolling out a motivational program to staff – you still need to apply this principle. The final business writing home truth is to get the way you articulate your message right – in other words, language and tone of voice. Research the way your target audience speaks and communicates, and phrase your message in their language. That may not be yours. But you’ll pick up more brownie points if the audience can identify strongly with your wording and style. Whatever you do, don’t fall prey to corporate pomposity and self-importance. It’s always more powerful to talk to “you,” not some vague third party, even if it’s a formal proposal or report. And always make sure there’s much more about “you” than there is about “us” and especially the “royal we.” That is the biggest turnoff of all. Can you think of any more business writing home truths we should remember?